When you or I buy a house, we think about things like location, driveway, number of bathrooms and if the kitchen needs updating. Doug Mcdonald considers solar orientation, air tightness, thermal bridging and ventilation. Which is why he and his family live in a Westport home that is constantly 73 degrees, with spectacular air quality — but no air conditioner, furnace o4 central heating system. The Mcdonalds pay nothing for gas, oil or propane. Oh, yeah: 20% of the heat is generated by the house’s appliances — and occupants. In 2010 Doug — whose profession is real estate — was looking for land to build on. Google Maps shows available real estate — who knew? — so he drove around Westport, and found property on Roseville Road. The house Doug Mcdonald bought -- formerly owned by Oscar Levant. It was the 1930s home of Oscar Levant, the pianist, composer, author, comedian and actor. 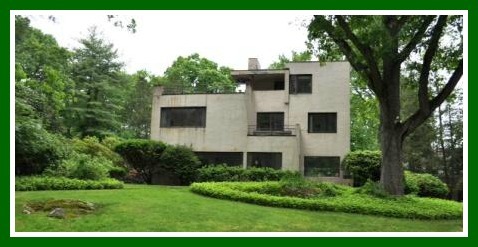 Designed by architect Barry Byrne — a disciple of Frank Lloyd Wright — it was solid concrete. It had also been vacant — and listed — for 3 years. The simplified shape appealed to Doug. Walking through, he realized he had to remove only 2 walls to achieve a modern floor plan. It was a perfect place to put into practice all the ideas he’d learned from the Passivhaus Institute. The German-based organization has developed rigorous standards for constructing “hyper-green” structures. The Levant house faced south. It sat high on a hill. The concrete construction meant high “thermal mass” (material that absorbs heat from a heat source, then releases it slowly). Doug created an “air balloon” inside. He made sure nothing on the building touched from the outside to the inside — including the windows. (A chimney, by contrast, is a classic thermal bridge. It touches the earth in the basement, runs through a house, then touches the sky. Doug blocked the chimney, using what he calls “nuclear grade” insulation: recycled glass infused with air.) The interior “absorbs” everything from the outside. Panels on the roof drop heat energy into a solar tank in the basement. That provides all the hot water the Mcdonalds need — plus radiant floor heating. Fresh oxygen is pushed through the house at all times. An energy recovery ventilator — Doug calls it a “magic box” — ensures that fresh air coming into the house exchanges its temperature and humidity with the air that’s leaving. Ceiling vent heads in every room ensure a constant 73 degree, 45% relative humidity environment. Doug Mcdonald in his living room. Note that the windows do not touch the inside of his home. The house is “incredibly cost effective,” Doug says. His electric bill is about $120 a month. At 4,000 square feet, it uses 90 percent less energy than a typical home. Yet there aren’t too many passive houses around here. Or anywhere in the US, for that matter. “The less diesel fuel needed to air condition and heat troops, the better,” Doug explains. Doug Mcdonald's home, after retrofitting into a passive house. But the stock of concrete houses available to convert to passive housing is minuscule, right? 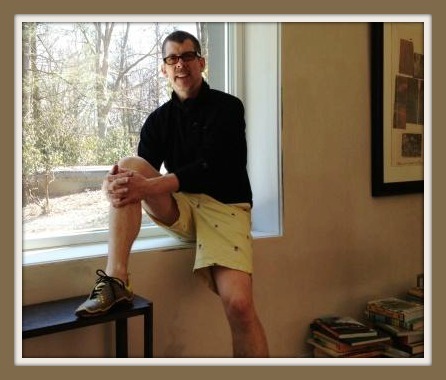 “I could build a center-staircase Colonial to Passive House Institute standards,” he says. In fact, he’d like to. Earlier this month, the Connecticut Neighbor to Neighbor Energy Challenge and Westport’s Green Task Force sponsored 4 tours of the Mcdonalds’ home. Dozens of interested residents trooped through the house. They marveled at the “magic box,” admired the “air balloon,” and breathed the high-quality air. And despite the constant opening and closing of doors, the temperature inside remained a very comfortable 73 degrees. 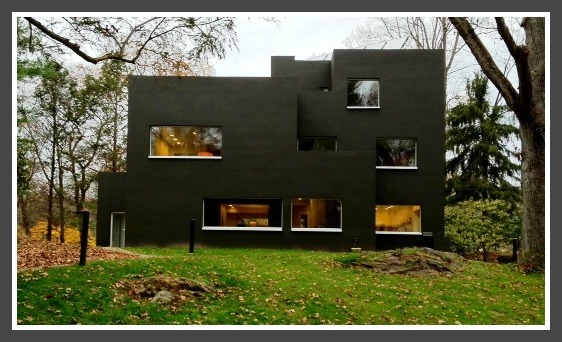 This entry was posted in Environment, Organizations, People, Places, Real estate and tagged " Passivhaus Institute, "passivhaus, Connecticut Neighbor to Neighbor Energy Challenge, Doug McDonald, Oscar Levant, Westport Green Task Force. Bookmark the permalink. Thanks Dan and Doug, for an interesting story. I’ve always been curious about that house. When I worked at CETA in the late 70’s we did a lot of energy conservation work in town by insulating schools and public buildings like Hales Court, it was quite a hot topic. I hope Doug’s house is part of a growing trend here in the US. How Very cool!! I was wondering what was going on at that house…Although modern isn’t my style, i think they added alot of charactor to it witht he changes that were made. My goal in the future is to go solar, I always wanted to install it on my Westport house (no obstructions to roof, and sun all day!) but maybe the next owners will. You can get 75% of the way there for about 5% the cost. My 2600 sqft Westport house with 1960s era insulation has an electric bill of $85/mo and I use only about 220 gallons of heating oil a year thanks to high efficiency lighting and appliances, targeted insulation upgrades and a super efficient wood stove (which, aside from producing free heat, keeps the furnace off unless the temps drop to the single digits). Even still, gotta love the solar hot water. I could cut my oil bill to near zero. Anyone have a recommendation on an insulating company to eval what I currently have and the cost to improve? Thanks. This is great stuff. The Germans (no need to mention the war) are SO far ahead of us on all this. Statements like 90% reduction if electric bill are inaccurate and misleading. A conventional 4000sf does not average $1200 per month in electric. While true passive houses can certainly consume much less energy to heat and cool over a conventional home, there are enough other items in the household that still consume the same amount of energy as they do in a conventional home.